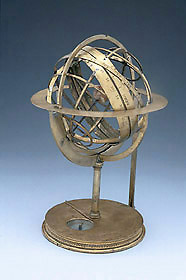 This is one of the earliest surviving armillary spheres and the assigned date is consistent with its simple form. Only later do such instruments include more complicated motions and planets. Here there is simply the celestial sphere, incorporating the motion of the sun, and a central earth. However, there is at least one more ambitious feature. Although the surviving instrument is incomplete, it has a very unusual adjustment for demonstrating Italian hours. In this method of reckoning time, hours are counted from 0 at sunset to 24 the following sunset. Thus the relationship between the scale of hours and the celestial sphere has to be adjusted according to the position of the sun in the zodiac. The scale on the equator is in hours from 1 to 24, and it can be moved, being arranged to slide outside the zodiacal band. Scales on the base give the position of the sun in the zodiac according to the date.